I'm starting a campaign. I think I'll start locally and then just move out from there. Actually I want to standardize two things, but I'm not sure if I should concentrate on one and achieve success, or if I should just let loose on both. What do you think? 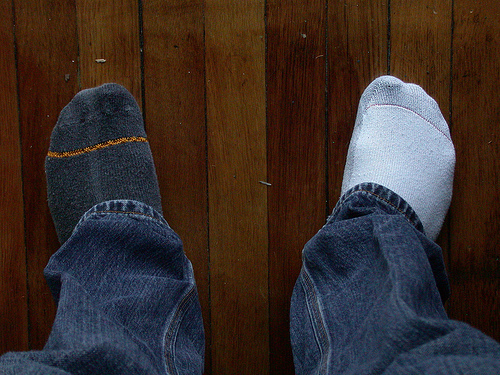 Campaign #1 STANDARDIZATION OF ALL MALE SOCKS INTO TWO CATEGORIES--Dark and white. I know you've thought this; why haven't we done anything about it????? Just for fun, hop up and go count your single male socks. Now, sit down with all the dark male mated socks in your life. Are they perfectly mated, or do you find microscopic pattern or color variations in your supposed "pairs"? I just finished mating Paco's socks. I have a gray one, a lightish navy blue one, a semi-black one, and one we'll just call bleh left over. Why oh why??????? Pick one dark color, America. Just one. We'll all adapt and deal with whatever choice is made. Let's put it on the next presidential ballot. I can wait that long if I know a change is coming. Campaign #2 STANDARDIZATION OF ALL BREAST SIZES--I've thought long and hard about this, and I realize this is an issue of cosmic significance. Far too many wars (both international, national, and domestic) have been fought over the attention given to breasts. They pretty much rule the planet if you think about it. They've been the groundwork for some pretty badly matched marriages and caused many a man to lose his footing. I say we genetically engineer a set of good working breasts for one and all and call it good. One size fits all. They'd become commonplace-- about as interesting as the nail on your pointer finger. We could dispense with all the crude comments and innuendoes and put more energy toward line dancing or something. No more exploitation. No more advertisers yelling, "Cleavage! More!". Breasts need to become something all women just have two of, and we can move on from there. Am I right, or am I right? That's my plan. Who's in? I see absolutely nothing wrong with either of those. I'll come out ahead on both accounts. I'm in!